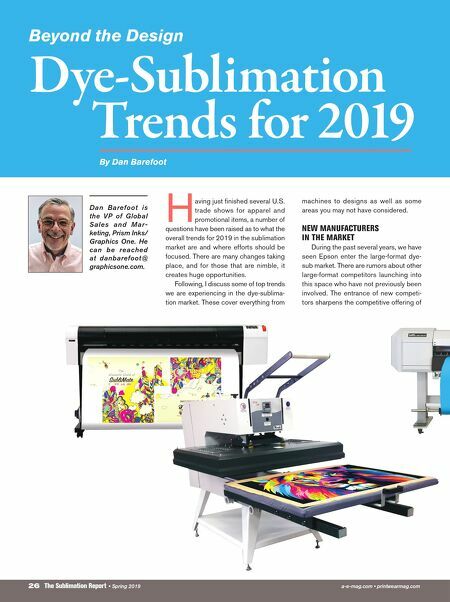 a-e-mag.com • printwearmag.com Spring 2019 • The Sublimation Report 27 all those in the market, and the end result is better pricing and value for those who are actually using the equipment. As a producer, it's wise to pay attention, espe- cially if you are considering entering the large-format world. DESKTOP TO LARGE FORMAT This leads into the second trend I'd like to touch on. Traditionally, the market has been segmented between desktop dye-sublimation and large-format pro- viders. It is highly likely that one of the major ink or printer manufacturers will take this opportunity to start offering everything from desktop-based solutions to industrial solutions. MARKET SEGMENTING BETWEEN HOME-BASED AND INDUSTRIAL The mom-and-pop market continues to thrive and dominates the hard goods, per- sonalized, and promotional items market. A new user can enter the market for about $1,000 for a complete letter-sized solu- tion. 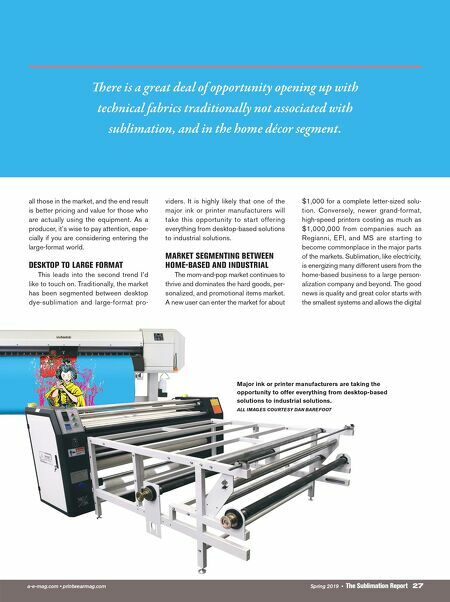 Conversely, newer grand-format, high-speed printers costing as much as $1,000,000 from companies such as Regianni, EFI, and MS are starting to become commonplace in the major parts of the markets. Sublimation, like electricity, is energizing many different users from the home-based business to a large person- alization company and beyond. The good news is quality and great color starts with the smallest systems and allows the digital Major ink or printer manufacturers are taking the opportunity to offer everything from desktop-based solutions to industrial solutions. ALL IMAGES COURTESY DAN BAREFOOT ere is a great deal of opportunity opening up with technical fabrics traditionally not associated with sublimation, and in the home décor segment.